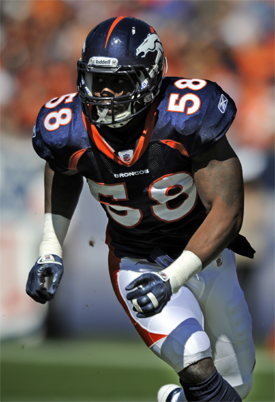 Linebacker Von Miller earned the Associated Press NFL Defensive Rookie of the Year Award and the Broncos were honored with the 2011 GMC Never Say Never Moment of the Year for their come-from-behind victory over Chicago in Week 14, the league announced on Saturday. 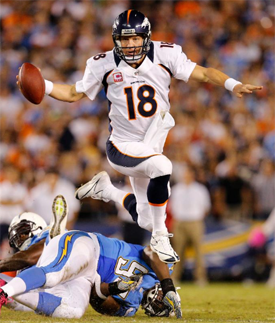 The awards were given at the inaugural NFL Honors awards show in Indianapolis. For the second straight year, the first two players selected in the draft have been named AP offensive and defensive rookies of the year (Sam Bradford, Ndamukong Suh, Cam Newton, Miller). 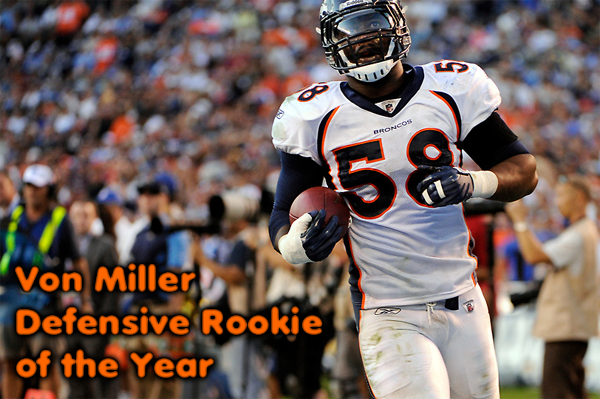 "I was extremely surprised,” Miller said of winning defensive rookie of the year. "(49ers LB) Aldon Smith had a great season. All the defensive rookie candidates had great seasons — (Bills DL) Marcel Dareus, (Cardinals CB) Patrick Peterson — I was just honored to be nominated. To get the award is extremely humbling." Miller tied a franchise record by totaling 11.5 sacks during his rookie campaign. That figure ranked second among rookies and tied for ninth overall in the league. In 15 regular-season games (15 starts), he totaled 64 tackles (50 solo), 19 tackles for a loss, four passes defensed and two forced fumbles. Additionally, he was one of just six NFL players this season to record at least a half sack in 10 or more games. Miller was a force all year long and one of the best players in the entire NFL regardless of rookie or veteran status, and he earned a trip to the 2012 Pro Bowl where he sacked Cam Newton twice. "It feels great," said Miller, who credited Linebackers Coach Richard Smith with pushing him to such success throughout the season. "Hats off to my organization and teammates." "First of all, the award is all for him," said Broncos' football operations boss John Elway. "He's the guy who went out and did it. Considering he didn't have an offseason for us, learning the defense — with the year he had there's just so much more upside for him that he's just going to get better and better." 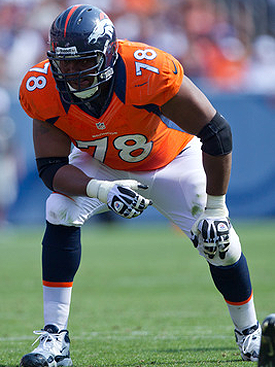 Along with his Defensive Rookie of the Year honor, Miller was named a second-team All-Pro selection by the AP in addition to representing the AFC as a starter for the 2012 Pro Bowl. 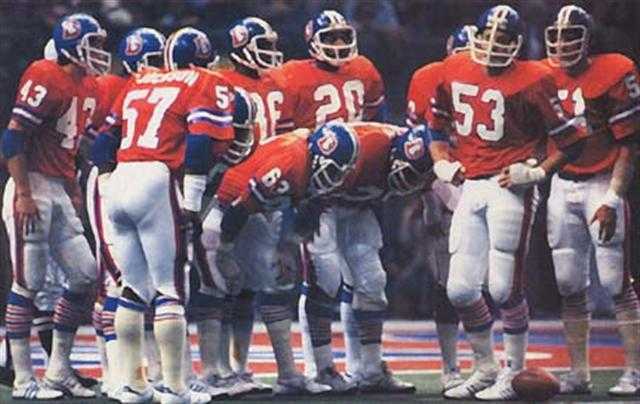 He is the second player in Broncos history (LB Mike Croel, 1991) to be named as the NFL’s Defensive Rookie of the Year. Broncos were named on other ballots too. John Fox placed third for the NFL Coach of the Year behind San Francisco's John Harbaugh and Green Bay's Mike McCarthy. Great year to all and congrats to Miller. ~ Aussie. 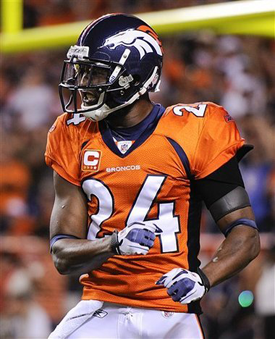 The NFLPA database does not list Broncos SS Brian Dawkins as being under contract for 2012. Dawkins' old contract listed him with a 2012 base salary of $6 million, but he appears to be an unrestricted free agent after the Broncos did some kind of tinkering with the deal, either last offseason or during the year. Dawkins has a career-threatening neck injury and may be forced into retirement anyway.